Esattamente come ci si aspettava, ecco di gia' la versione 0.01 tradotta in inglese da CloneCharizard del Pokésav di COM, nell'edizione apposita per i neonati remake Heart Gold e Soul Silver, la quale permette di modificare i vostri salvataggi in ogni minimo dettaglio, dai Pokémon stessi fino ad ogni tipo di oggetto e cosi' via, il tutto con qualche rapido colpo di click. Today I have finished translating the Pokésav for Pokémon HeartGold and SoulSilver into English. 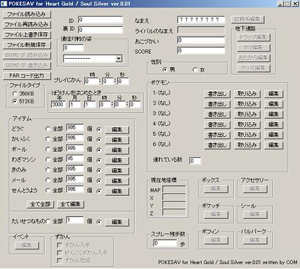 This Pokémon HeartGold and SouSilver Pokésav is still at Version 0.01 so it will not let you do everything & there are very few things (little things) that are still remaining in Japanese but that will change with the Pokésav HG/SS Version 0.03, I will put the download links here for you to download.